CarGurus has 14,641 nationwide Passat listings starting at $1,991. The Passat is built at Volkswagen’s Chattanooga, Tennessee, facility and designed with American buyers in mind—that means space, and lots of it. One of the most important aspects of going to a high-school reunion is what to wear. You want to dress up but not too much, so as to send the right message. Go in a suit, and people will think you’re either overcompensating or that this is the biggest thing that goes on for you all year. Dress too down, and folks will think you haven’t done anything with your life (because people are mean). You need to strike a blend of casual and classy that says, “I’m doing important things, but I’m not full of myself.” You might have difficulty striking this balance with your attire selection, but a Volkswagen Passat sends all the right messages, delivering you to your night of catching up (read: comparing careers and seeing who’s married and has kids) at the wheel of an attractive, composed sedan. The fifth-generation 2014 Passat is part of Volkswagen’s campaign to target larger sales numbers rather than the enthusiast drivers who could always rely on VW for corner-carving fun. The new Passat is larger, with a ride that will appeal to a far greater audience and technology that any driver can appreciate. What any buyer wants is a car that looks more expensive than it really is. The Passat plays that role perfectly, with sharp angles, aggressive headlights and a flat chrome grille that borders on stoic. 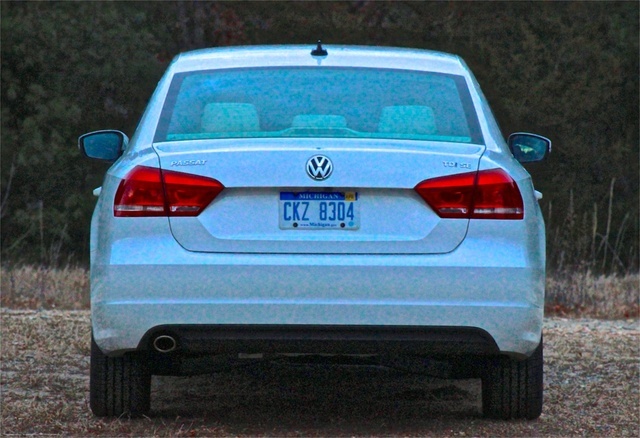 Our TDI SE model featured 17-inch alloy wheels but did not include foglights. At night, the license plate area is illuminated by ultra-bright LEDs that might leave some thinking this is an Audi at a quick glance. That may be the perfect effect you want to leave when you pull up to whatever local function hall or nearby hotel bar has been rented out for your reunion. Inside, the Passat features an interior that is simple but never feels spartan. Though our test model featured hard plastic and the V-Tex fake leather that Volkswagen shills, the lines of the cabin are, once again, aesthetically upscale. 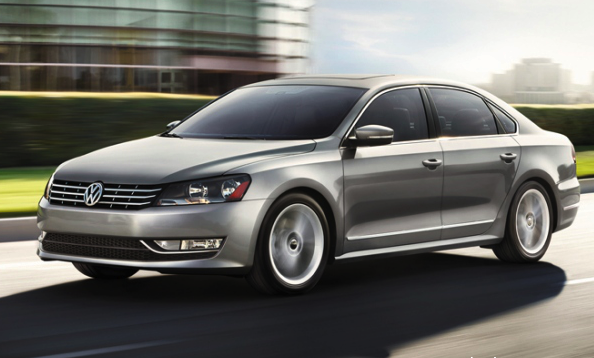 There are 4 powertrains from which to choose for the 2014 Passat. For $20,845, the base engine is a 168-hp 2.5-liter inline 5-cylinder (I5). It has been my experience that I5 engines are almost never smoother than their 4- or 6-cylinder counterparts, and even in the smaller Jetta, this powerplant is underwhelming. One can only imagine what it's like in a car that's almost 600 pounds heavier. Next up is the 1.8-liter turbocharged inline 4-cylinder model, which starts at $30,895 and comes only in the SEL Premium model. It makes 168 hp and 184 lb-ft of torque, which is not very exciting but gets you where you need to go. Both the 1.8 turbo and 2.5 I5 send power to the front wheels through either a 5-speed manual or a 6-speed automatic transmission. The cheaper 2.5 does not offer any efficiency gains, as its 22 mpg city/32 highway rating (31 highway with the automatic) is bested by the 1.8T's, which are 24/35 (34 with the automatic). The turbo delivers enough power, but if you feel the need for some actual getup, you’d do well to select the 3.6-liter V6, which starts at $29,295. This engine delivers 276 hp and 258 lb-ft of torque, sent to the front wheels through a 6-speed direct shift gearbox, also known as DSG. This model returns 20 mpg city/28 highway. The mileage master and the vehicle that we spent the most time with was the diesel-fueled TDI model, which starts at $26,295. It features a 2.0-liter turbodiesel inline 4-cylinder. It makes a scant 138 hp but a rather impressive 236 lb-ft of torque. This is a far cry from the V8-like torque made in its distant sibling the Audi A6 TDI, but at low RPMs this diesel four-pot actually moves. Our test model was equipped with a 6-speed manual transmission, offering one extra cog of RPM optimization. 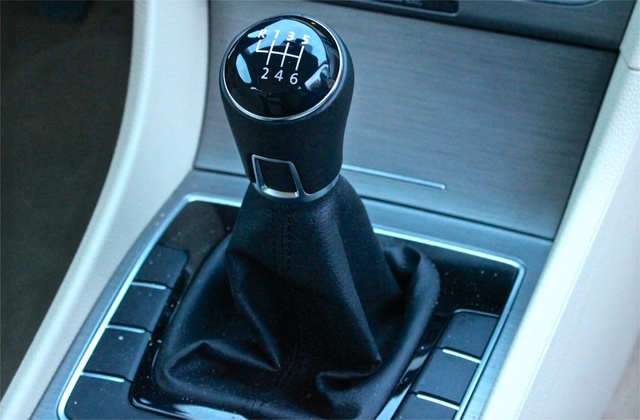 A 6-speed DSG is also available. In accelerating, the Passat TDI moves quickly from a standstill, but due to its low horsepower and relatively close gear ratios, you have to shift early and often to get anywhere. 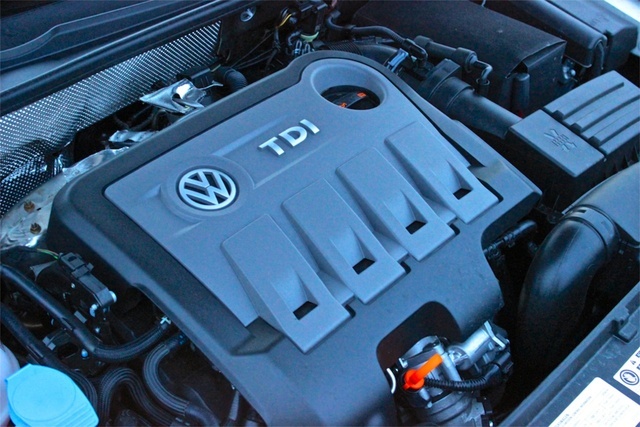 You rev out of each gear quite quickly, but are met by yet another gear change that can bring forth the TDI’s great low-RPM power. The Passat does not have a locked-down performance suspension, but it never felt too squishy either. It can sop up bumps and potholes but feels surprisingly level and composed if you enter an on- or offramp with a great deal of speed. It's the kind of suspension composure that will not compel you to take the Passat to a track, but allows you to make a real-life turn in traffic with minimal body roll and discomfort to your passengers. The Passat is built at Volkswagen’s Chattanooga, Tennessee, facility and designed with American buyers in mind—that means space, and lots of it. Take the rear seats, for instance. With 42.4 inches of rear legroom, the Passat is in the same neighborhood as the Honda Accord, but a good deal longer than other competitors like the Ford Fusion and Chevrolet Malibu. As for the HVAC and stereo controls, they are simple and easy to use. The non-navigation touchscreen is flanked by real-live buttons on either side for the major infotainment controls, like radio band, phone and vehicle setup. As always, we test-drove the tech on the Passat, and in most areas, it passed with flying colors. Pairing a phone via Bluetooth was easy, and the Passat responded to commands without issue, which by the 2014 model year should be a requirement. 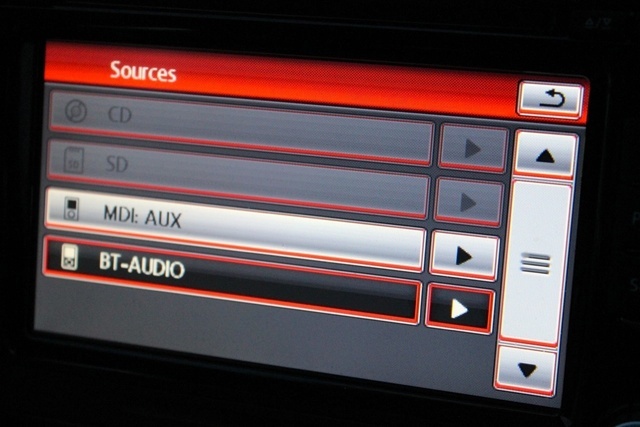 The Passat’s digital interface allowed us to not only switch between Bluetooth and USB-connected devices quite easily, but also gave impressive access to a smartphone’s music files, by artist and more. I had a serious playlist of 1990s music queued up for my drive. One major setback is the vehicle’s hardline iPhone connection. The auxiliary data input for any car should be a simple USB port. For as much as smartphone cable connectors change and evolve, USB remains. This is exemplified by the mess that was caused when Apple changed the connector for its latest iPhone. Anyone using products compatible with the previous connector had to pony up for a new adapter—if that was even an option. If your car had one of those non-removable proprietary cables for the iPhone, you were out of luck when upgrading to the iPhone 5. If you had only a USB input, you could connect any device you wanted. Oh, and that already-outdated cable (which may or may not come with an iPhone 5 adapter as standard equipment) is too short. It doesn't even make it out of the tiny center console bin in which it is located. So you have to decide between connecting your phone via Bluetooth and placing it where you can see it or connecting it via cable and hiding it in the console. Controls for any other music app than iTunes will be limited to pause, skip back and skip ahead, so the cable issue comes down to how you use your phone in the car. Those of you who text while driving (and you shouldn’t be, especially in a car with a manual transmission!) will find it very annoying to have to stow the phone out of sight. In addition to the barrage of front and side airbags found on all new vehicles, the 2014 Passat also features electronic stability control, antilock brakes with hydraulic brake assist and a crash-absorbing front crumple zone. In the event of a crash, the Passat also features an Intelligent Crash Response System, which automatically turns off the fuel pump, unlocks the doors and activates the hazard lights. These key steps make your vehicle easy to spot and access by first responders. The Passat has earned the Insurance Institute for Highway Safety’s coveted Top Safety Pick accolade and is actually a 2013 Top Safety Pick+, with the "plus" representing a new dynamic of testing for the safety organization. The vehicle also earned a 5-star safety rating from the National Highway Transportation Safety Administration. Were it not for a puzzling backup camera interface, the Passat would have scored a 10 for safety. For some reason, an entire menu bar just for the Return button shows up on the right side, shrinking the screen. When it comes to a feature owners will use as much as a backup camera, anything that unnecessarily diminishes its size is not wise. The Passat starts at just a little under $20,000, which is insane. The car was styled in such a way that every time I see one, it looks like it cost 10 grand more. You have to pay more for the TDI, but get rewarded with the best Passat fuel economy. With the turbo and V6 models, you’ll pay $30-to-35K, but you'll get one of the two best engines and a host of the best leather and technology features. Things to factor into your engine decision should include gas versus diesel prices in your area, as well as how many diesel stations are near you. Large highways that support trucking lines will always have diesel pumps nearby, but they're not as common in some suburban areas. Also, the urea injection that keeps the diesel emissions clean needs to be refilled roughly every 10,000 miles, and the car will not start without it. A quick glance at the competition reveals other family sedans have similar pricing spreads to the Passat's, starting in the $20-25K range and climbing to the mid-$30,000 range when you start going for the goodies. What those other vehicles do not have is the composed, German-engineered handling feel of the Passat. Ford tried to replicate it with the stiff ride of the Fusion, but all you’re left with is a ride that will shake your fillings loose. The Passat looks more expensive and rides better than similarly priced vehicles, and it's frankly one of the best sedans in the lower-$20,000 range. 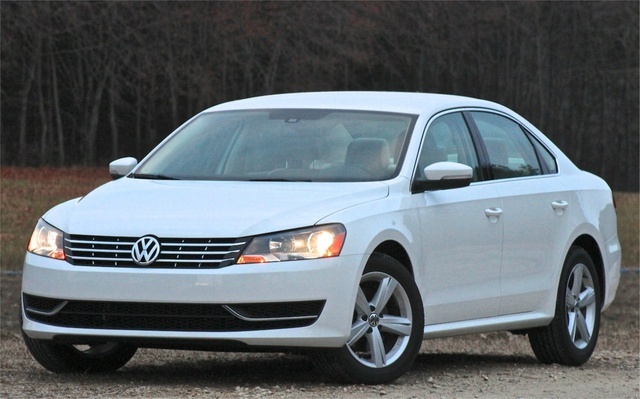 What's your take on the 2014 Volkswagen Passat? 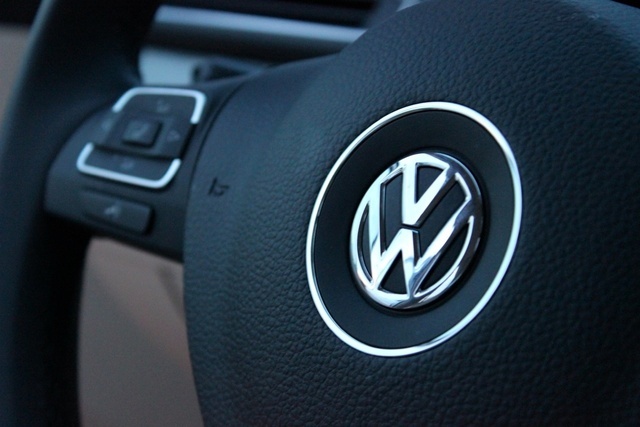 Users ranked 2014 Volkswagen Passat against other cars which they drove/owned. Each ranking was based on 9 categories. Here is the summary of top rankings. Have you driven a 2014 Volkswagen Passat?